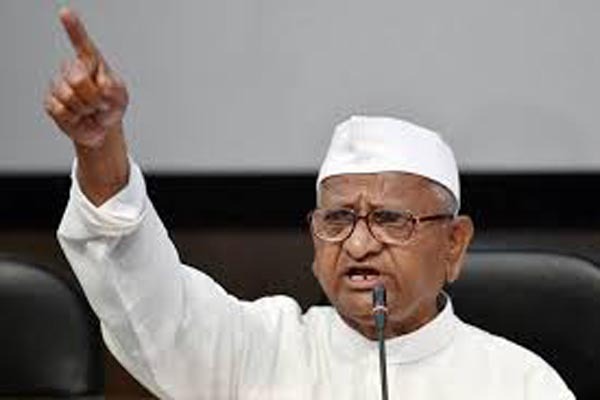 Ralegan Siddhi in Maharashtra(PTI): The Gandhian Social activist Anna Hazare said today he will launch a hunger strike from October 2 against the Union government for the delay in appointment of a Lokpal at the Centre. He also appealed people to join him in his campaign for a corruption-free country. “I will go on a hunger strike from October 2, the birth anniversary of Mahatma Gandhi, at my native Ralegan Siddhi village in Ahmednagar district of Maharashtra,” the anti-corruption crusader told PTI. He criticised the NDA government, saying it had earlier assured it will appoint the Lokpal and implement the Lokpal Bill, passed by Parliament and signed by the then President in January 2014. “But there is a lack of will in this government to curb corruption and hence, it is giving a lot of reasons and delaying the appointment of the Lokpal,” Hazare said. Hazare, who has been the face of the Lokpal movement, went on a 12-day hunger strike in 2011. He later launched a fast, which enjoyed a huge popular support across the country. The UPA government later passed the Lokpal bill. The Supreme Court had earlier this week expressed dissatisfaction over the Centre’s response on appointment of search committee members for a Lokpal. The Centre had earlier told the apex court that the Lokpal selection committee, headed by the prime minister, was scheduled to meet to set up a search panel for recommending a panel of names for the appointment of the anti-graft ombudsman and its members.